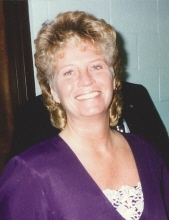 Tonya Kaye Fields-McDougall, age 60, long time resident of Ponca City, Oklahoma, passed away Monday, December 3, 2018 at her home. Tonya was born on June 10, 1958 to Elmer Bentley Fields and Ernestine Faye (Cook) Fields Becke in Ponca City. Tonya was raised in Ashland, Oregon before returning to Ponca City in the Early 1980's. In the early 1970's, Tonya married Randy McDougall and in the mid 1970's Tonya had her first Daughter, Mandi, then Shawna before they divorced in the late 1970's. Her daughter Jamie joined the family in the mid 1980's. While in Ponca City, Tonya worked as a warehouse stocker at the Albertson's warehouse until she was unable to work anymore. All the while, Tonya cared for the local strays at her home. Since her childhood, Tonya had a warm heart for earth's creatures. She took in many stray cats and dogs, and as a young person, even tried to free them from the local humane society. In addition to looking after the animals, Tonya enjoyed shopping online, playing solitaire and cruising Facebook. She will be dearly missed by her family and friends. Survivors include her daughters, Mandi McDougall, Shawna Ewing, Jamie Stanton and husband Brad, all of Ponca City, dad Lewis Bud Becke of Ponca City, grandchildren: Kyle McDougall Casteel and partner Marty Casteel of Stillwater, Kamryn, Angel, Hunter, Christina, Taylor, Lariat, and Bradlyn all of Ponca City as well as numerous nieces, nephews and dear friends. Tonya was preceded in death by her parents, siblings: Mike, Gary, and Paula. A memorial ceremony to celebrate Tonya's life will be held at a future time. Cremations arrangements are under the direction of Trout Funeral Home & Crematory. Tonya may be remembered with a memorial contribution made to the Ponca City Humane Society, 900 W. Prospect Ave., Ponca City, OK 74601, www.pchumae.org/donate. To send flowers or a remembrance gift to the family of Tonya Kaye Fields-McDougall, please visit our Tribute Store. "Email Address" would like to share the life celebration of Tonya Kaye Fields-McDougall. Click on the "link" to go to share a favorite memory or leave a condolence message for the family.